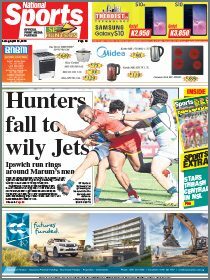 GYG Estate Kokofas scored double victories in the Central Premier Rugby League’s A grade and women’s elimination finals at the Murray Barracks Oval on Saturday. In the A grade, Kokofas beat KK Kavila 34-12 and in the women’s fixture they edged Lealea Sharks 6-0. The National Capital District-based teams beat their out of town rivals to keep their semifinal hopes alive for another round. The Kokofas A grade take on Lealea Sharks while their women are up against the Toks Mix Dogs. Despite not having proper training or fitness levels but their better skill and team play has got them through with A grade coach Nelson Moide pleased but knowing his team still have areas to improve. “It is unbelievable, we’ve had poor turnout in training but when they turn up for the game they play well,” Moide said. Women’s coach Alex Malabag said his side were lucky to beat the Sharks. “We were lucky that our senior players in Angela Parao and Iga Kere stood up and I was impressed with some of our younger players in Boni Murray Peto and Rose Malabag,” Malabag said. All the elimination final winners will play the losers of the qualifying finals which is expected to be confirmed today by the match committee. Results: A Grade – Lealea Sharks 14 Beowaiki 10, Goilala Karukas 16 Hisiu Knights 10, Koiari Osisi 12 Inawabui Hawks 4, Goilala Nuggets 8 Gordon Dragons 6, Toks Mix Dogs 12 Vewala Pelagai 10; Women – Goilala Karukas 16 Goilala Nuggets 0, Gordon Dragons 4 5-Mile Okuk Watchdogs 0, Koki Amazon Seagulls 4 Toks Mix Dogs 0.